A grand spectacle in the evening sky created by a spacebound rocket delighted stargazers and frightened the uninformed across hundreds of miles in the southwestern United States on Thursday. The six-story Minotaur rocket soared off its launch pad at 7:24:29 p.m. PDT (10:24:29 p.m. EDT; 0224:29 GMT) from Vandenberg Air Force Base in California carrying an experimental military spacecraft. Billed before launch as a potentially stunning blastoff, the mission delivered with a fast-growing cloud of colors painted in the darkening sky. Residents throughout central and southern California were treated to ringside seats, but folks as far away as Utah, Nevada and Arizona witnessed the incredible sight. Television stations and local authorities reported being flooded with calls wondering what had happened. 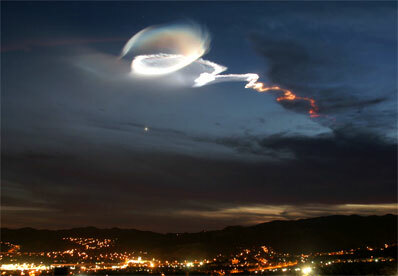 The Minotaur's ascent to reach the desired orbit around Earth was timed perfectly to produce a spectacular "twilight phenomenon" that occurs when rockets or missiles are launched just before sunrise or shortly after sunset. 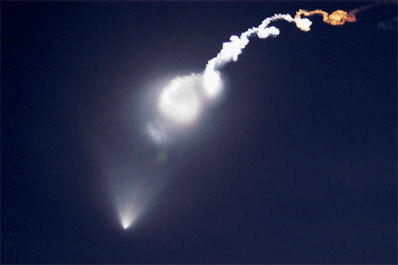 Unburned fuel particles and water drops in the rocket's contrail freeze in the less dense upper atmosphere and get reflected by sunlight at high altitudes to generate such breath-taking scenes. The winds aloft twist the exhaust cloud, giving it a corkscrew effect. Vandenberg Air Force Base, positioned along the Pacific coastline 140 miles northwest of Los Angeles, has hosted more than 1,700 launches since December 1958. But only a fraction of the flights have displayed such a spectacle. The rarity prompted many space enthusiasts to plan ahead for Thursday's launch, scouting out prime viewing spots to observe the moment. 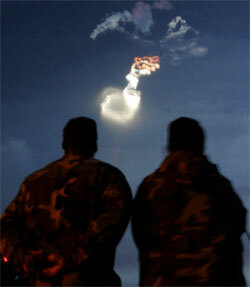 It was the first such twilight launch in several years, and weather conditions didn't spoil the show. The Orbital Sciences-managed Minotaur rocket uses decommissioned first and second stages from a Minuteman 2 ICBM missile and solid-propellant motors from the commercial Pegasus rocket program for its third and fourth stages. The vehicle is designed to provide the U.S. government with reliable access to space for small satellites. The $20 million Minotaur deployed into a sun-synchronous orbit around the planet's poles the Space Test Program-R1 mission's Streak satellite. Built by General Dynamics C4 Systems/Spectrum Astro Space Systems in Gilbert, Arizona, the craft will be operated by the Defense Advanced Research Projects Agency. "Streak is a technology demonstrator whose objective is to demonstrate rapid response, short mission life, low Earth orbit space technologies and gather information about the low Earth orbit environment," a DARPA spokesperson said. Information released by DARPA indicates Streak is fitted with two instruments -- an ion gauge and an atomic oxygen sensor. "The vehicle will characterize the orbital regime, demonstrate operational feasibility from a command and control standpoint and also from a platform perspective for future DoD missions," the spokesperson added. DARPA is the Defense Department organization whose mission is "to maintain the technological superiority of the U.S. military and prevent technological surprise from harming our national security by sponsoring revolutionary, high-payoff research that bridges the gap between fundamental discoveries and their military use." Streak's price tag is classified. 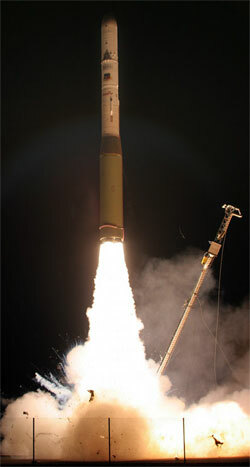 This was the fourth Minotaur launch. The Air Force says another is planned on December 18 from Vandenberg to loft a cluster of tiny satellites for a joint Taiwan-U.S. project, called COSMIC, to study the atmosphere.